Although Oaxacan wood carvings have been around for less than 60 years, they have become one of the most popular folk art styles in Mexico. The monos de madera or alebrijes as they are called in Spanish were originally created by carver Manuel Jimenez but soon became so popular that other people from his town and a few other communities in Oaxaca began carving to have an extra income. The economical boom created by the popularity of these colorful creatures has given many families the chance to have a better life in one of the poorest areas of the country. Oaxaca has a wood carving tradition dating from pre-Hispanic times; Zapotecs used to carve religious totems and ceremonial masks. Following the Spanish conquest carvers made wooden saints, angels, crosses, altars and masks. 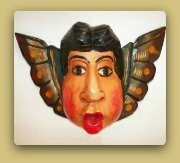 The masks were used in dances and representations about biblical passages and Christian stories that helped friars catechize the native people. After the Independence War wood carving dwindled. Masks used in traditional dances and animal and human miniature figurines made as toys for children were carved by few artisans as a side job. In the 1940's, with the construction of the Pan-American Highway, Oaxaca opened up to tourism. Folk art stores were opened in Oaxaca City and the Monte Alban archeological site and artisans finally had an outlet for their crafts. Manuel Jimenez a peasant from San Antonio Arrazola is the creator of this renowned folk art style. Carvers Isidoro Cruz from San Martin Tilcajete and Martin Santiago from La Union Tejalapan had a share in the process of making these whimsical creatures one of the best known styles of Mexican folk art. Native of Arrazola, a small village in the Oaxaca Valley, he is considered the father of the Oaxacan wood carvings tradition. Jimenez began carving very young while tending goats; he started selling masks and wooden miniatures, mostly farm animals and human figures in Monte Alban. In 1957 Arthur Train who had an Art Gallery in Oaxaca City discovered his work and was captivated by his talent. He promoted his career and sold his pieces. In the 1970's important collectors like Nelson Rockefeller and folk art museums purchased his carvings establishing Jimenez reputation and consolidating the creation of the new folk art style. Born in San Martin Tilcajete in 1934 he began to carve at age 13 during a long illness. He sold his work at Oaxaca City where he met Tonatiuh Gutierrez who later became FONART Director. Gutierrez encouraged Cruz to keep carving and later appointed him as the manager of the State's craft promoting center. 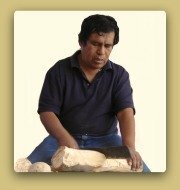 During that time Isidoro got to know many merchants and was able to sell his work and the work of other carvers from his town boosting Tilcajete's carving development. Isidoro was very open with his techniques and always willing to help fellow carvers. 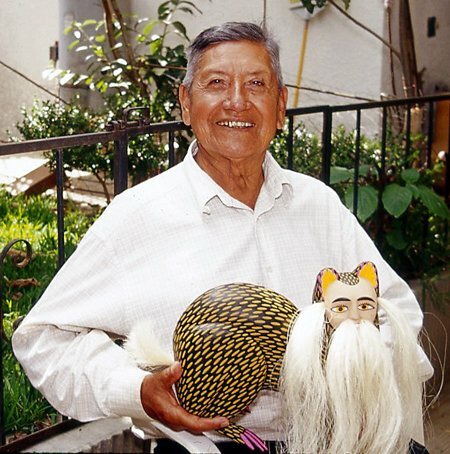 He began carving in 1960 after coming back to La Union Tejalapan from the U.S where he worked in the bracero program. Like many other farmers Martin could not support his family with the farming income; this encouraged him to become a carver. He specialized in saints, angels, devils, rodeo scenes, Nativity scenes and motifs related to the Day of the Dead. His sculptures are painted by his daughters Benita and Carolina. The wood comes from the copal tree (Bursera glabrifolia). Fresh-cut copal wood is soft and easily workable; it has a small heart so it does not split. It sands to a smooth porcelain-like finish and it doesn't absorb much paint. Copal wood is very susceptible to bugs; a good practice after acquiring an Oaxacan carving is to wrap it in a plastic bag and freeze it for a week. That will eliminate all the bug eggs the piece might have. The carving is done with machetes, kitchen and pocket knives. The shape of the branch dictates what can be made. Most figures are carved within a day or two. Once carved and sanded the piece is painted with acrylic paints. Aniline paints were used to paint the carvings but most artists stopped using them because they fade. At the beginning the whole process was done by the men, who also signed the piece but with the increasing demand the whole family integrated to the creation process. Often, men carve, children and elderly sand and the women paint. This is especially true in San Martin Tilcajete where women had an embroidery tradition of centuries and have a delicate trace. Workers out of the family are rarely hired to avoid giving out the know-how. Not all the Oaxacan wood carvings are the same quality or price; most of the figurines are mass produced and sold relatively cheap. Carvings that are well done and carefully painted are usually made by well known artists and are considered collectible items therefore their price is higher. 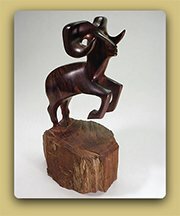 Oxacan wood carvings have two main styles: while some carvers express themselves making fine and delicately carved pieces others make rustic pieces that are roughly carved. The same happens with the painting; some pieces are intricately decorated with Zapotec motifs, geometric shapes, flowers or other patterns and other artists prefer simpler decorations. Motifs are dictated by demand and by the competition which forces carvers to look for different subjects to stand out from the others; this explains how the alebrijes created by Pedro Linares became even more famous when wood carvers from Oaxaca adopted the mythical creatures and adapted them to their art. The most popular figures are all kinds of animals and among them the cat is the preferred one by costumers. Other subjects are angels, devils, skeletons, mermaids, saints and nativity scenes. Arrazola was the home town of Manuel Jimenez the creator of the Oaxacan wood carvings tradition. It is located 10 km south east Oaxaca City. Until after the Revolution War Arrazola was a large sugar plantation where people from all Oaxaca went seeking for a job. When it became a town in the 1920's the inhabitants shared different backgrounds and culture. Arrazola doesn't have the sense of community that other towns in Mexico have. Foreign tourists and folk art dealers began to visit Manuel Jimenez in his house around the 1970's. 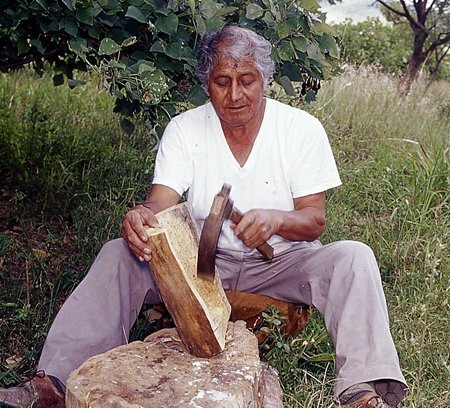 Although Jimenez never shared his techniques with anyone outside his family, by the early 1980's other people from Arrazola began to carve and benefit from the tourism that came into town to see him. 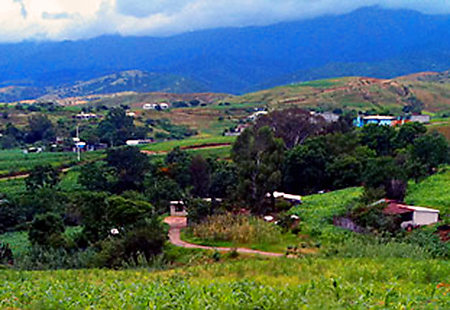 La Union is a small isolated village on the mountains located 12 km west Oaxaca City. Oaxacan wood carvings didn't develop in La Union like they did in Arrazola and Tijacajete because the small hamlet never attracted as much tourism as the other carving towns. Nevertheless the Santiago family members created a style of their own which include rustic figures and multiple-piece compositions like rodeo scenes, Nativity scenes and Day of the Dead motifs and have gained international recognition. Tilcajete is located 25 km south Oaxaca City. It exists as a town since 200 years BC but changed its location several times before establishing where it is located today. The name Tilcajete comes from the words til (cochinilla dye) and cajete (water well). 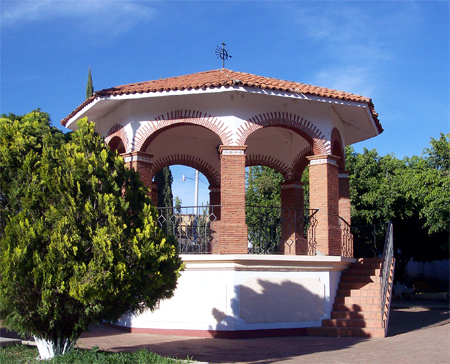 The well that gave the town water can still be seen in the streets of Cajete and Progreso. The cochinilla dye is used to dye the traditional apron called tilma; the apron was used by men and women to protect their cloths. Nowadays the tilmas are worn in traditional dances. 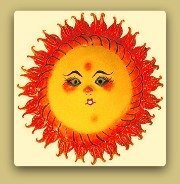 The town had a weaving and embroidery tradition that dwindled when women began painting the wood carvings. 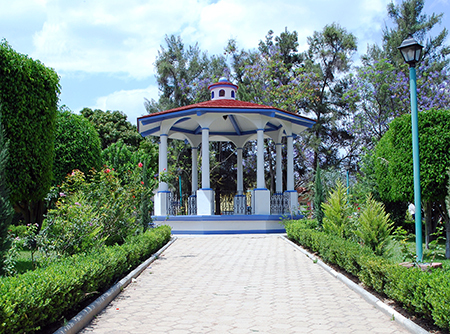 San Martin Tilcajete is an example of a town with a community sense in southern Mexico; people help each other and work to benefit the whole town. 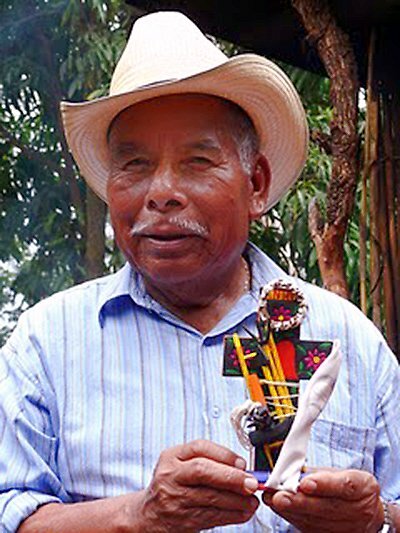 Isidoro Cruz help and encouragement were fundamental in the development of the wood carving activity in Tilcajete but so it was the kindness of the people that welcomed tourism with joy. Manuel Jimenez descendants lead by his sons Angelico and Isaias Jimenez Hernandez have founded a family workshop that continues Manuel's artistic tradition. 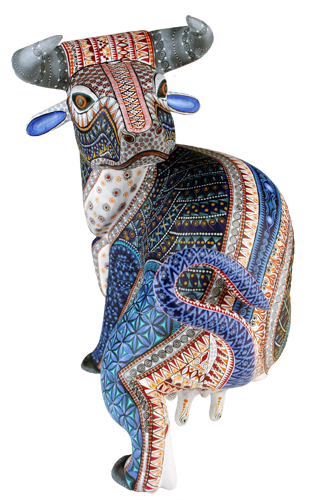 Armando carves and paints mostly large animals decorated with vibrant colors. 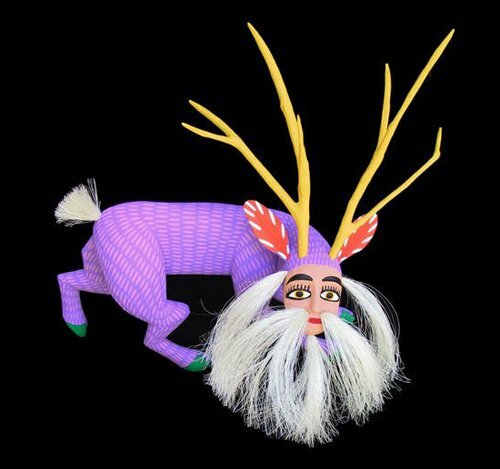 Moises carves animal figures that appear to be moving and are often accompanied by their offspring and alebrijes. The delicate and striking painting is done by his wife Oralia Cardenas. Antonio Mandarin and son Rene Mandarin Ramirez make delicate carved and painted figurines, among their classics are reptiles, dragons, cats in cloths, horses and giraffes. Jose aka Pepe and his large family carve a great variety of wooden figures. They specialize in armadillos, giraffes, iguanas, alebrijes, mermaids and masks. Magdalena (daughter of Jose Santiago) and her husband Orlando (son of Antonio Mandarin) specialize in Catrina sculptures; he carves them and she delicately decorates them. Miguel is a versatile and exceptionally gifted artist known for his intricately painted animals. One of the most famous carvers in Arrazola he has been working since 1985. His son Vito has been helping his father for many years and recently began selling his own pieces. Mario carves from one single piece of wood lizards with convoluted shape tails that are beautifully painted by Reina. The quality of their pieces is unsurpassable. Mario also carves octopus, deer, dogs, rams and coyotes that are decorated by Reina's Zapotec designs. Bertha is best known for her amazingly intricate painting technique. Her pieces are carved by her husband Alfonso Castellanos Ibañez. She decorates alebrijes, armadillos, cats, rabbits, coyotes and turtles with Zapotec motifs in subdued colors. An excellent carver he specializes in lizards and dragons that are intricately decorated with bold colors. He was Mario Castellanos' teacher. Narciso and his wife are renowned for their dogs; lean and with clearly visible hip bones and ribs they are decorated in vibrant colors. Other carvings are otters, squirrels, turtles, cats and lizards painted with a unique style. Most of the carvers from this small village belong to the Santiago family. One of the pioneers in Oaxacan wood carvings Martin specializes in religious pieces such as Nativity scenes, virgins and angels. His figures include highly detailed accessories like small bouquets of flowers. Like most of La union carvings Martin's are decorated with aniline paintings. Martin Santiago considers carving his side job, being farming his most important activity. Martin's brother, Quirino, creates charming animals such as deer, tigers, lions and horses that have a primitive quality to them. Like his brother Martin Placido carves nativity scenes, virgins, devils, rodeos and Day of the Dead figures. He uses jacaranda wood because it is softer than copal. Francisco, the eldest of the brothers, creates whole scenes or single human figures and angels. His carvings have a serene expression and graceful forms. Martin's nephew, Maximino Santiago, makes representational scenes such as markets, church processions, Day of the Dead celebrations and schoolyards. He also creates individual figures of vendor ladies carrying wares and produce. His work is extremely detailed. Jaime is well known for his devils and skeletons, his viejitos dancing (aged couples) and multiple pieces rodeos and processions. Like his father Martin he is a full time farmer. Eloy, son of Placido, specializes in horse-drawn carts bearings mariachi bands, nativity scenes, groups of devils and fully dressed skeletons. His wife Justina does the painting with intriguing color combinations. Eloy's brother, Calixto, carves animal musicians of every variety, marimbas played by insect musicians, Virgin of Guadalupe figures, skeletons and mermaids. His wife Olivia does the painting with finesse and care. Calixto's carvings are made of jacaranda wood. Son of Maximino, Jose specializes in beautifully detailed cactus and flowers. Contrasting the traditional primitive carving of La Union artists Gabino creates finely detailed carvings that are intended to surprise the viewers. His carvings include cows and horses with the Virgin of Guadalupe on their bellies, angels and crocodiles with their young on their back. A pioneer in Tilcajete's Oaxacan wood carvings Isidoro specializes in devil and skeleton masks, Virgins plaques and sculptures based on ancient Zapotec and Mixtec artwork. With a simple and very expressive technique Isidoro has a style of his own that have gained him a special place among his fellow carvers. Jesus is best known for his whimsical cats and dogs delicately painted with his signature pattern based on amoebas saw through a microscope. He also carves other animals and skeletons, devils angels and masks. Jacobo carves large animals with human features that are decorated by Maria with such finesse that lines appear to be drawn with a ruler. The patterns used to decorate their pieces are based on Zapotec motifs. 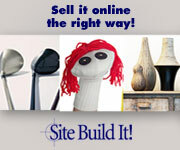 They craft human figures, armadillos, foxes, buffalos, coyotes, etc. The couple's artwork is highly appreciated around the world. Zenen (Zeni) Fuentes Santiago carves and paints lions, armadillos and giraffes among other animals. Efrain Fuentes Santiago carves and paints animals, mermaids, angels, skeletons and historical characters. Ivan Fuentes Santiago makes a host of animals, including fish, giraffes, cats and coyotes decorated with delicate lines. Rubi Fuentes Santiago paints the pieces carved by her husband Efrain Broa Vergara. They make large, colorful animal-figures decorated with Zapotec patterns. Maria paints pieces carved by her brothers Alberto, Aaron, Miguel, and Candido. Her patterns include butterflies, doves, rabbits and flowers that remind of the embroidery work she used to make. The family specializes on animals in graceful poses, angels and virgins. Inocencio is known for his groups of figures, drunken angels, skeletons or devils on a cantina table and his nahuales (man with an animal head) musicians. Luis has been a carver for more than 20 years; he specializes in multi- pieces mythical alebrijes that have to be assembled. The Xuana are known for their human figurines including Nativity sets and masks. Justo Xuana Luis specializes in Nativity scenes, animal musicians, angels and masks; while one of his daughters, Justina Xuana Fabian decorates his carvings his other daughter, Silvia, takes care of the whole creation process from carving to painting. Abad Xuana Luis carves and his daughter Flor Xuana Velasco decorates devils, angels, skeletons, mermaids and masks. Daughter Ana Xuana Velasco carves outstanding miniatures, specializing in masks and animals. Margarito is another of the original carvers of San Martin, his carving style is rustic and charming. He specializes in cats and masks.